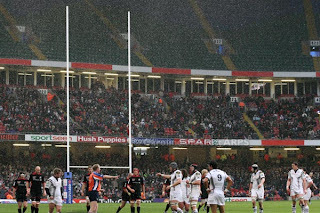 The second semi final was a painful thing to watch for the Saracens faithful, many of whom had travelled through sleet and snow in London to make their way to Cardiff for the game. I, for one, wondered why I'd bothered. To be fair, the first half was pretty tight, with only Shane Williams' unconverted try and a penalty from James Hook giving the Ospreys an 8-0 advantage at the break. We also had a 10-minute spell of snow, leaving the supporters and players to rue the decision to leave the flaming roof open! I don't know who had done the team talk for Sarries at half time, but I think it was the same bloke who made the one against Newcastle just after Christmas! Please stop already! Basically, the floodgates opened. Sarries buckled and the Ospreys made light work of scoring 3 tries and a total of 22 points to Sarries' 3! NOT a good day at the office for the Men In Black, nor their supporters who trudged back to their buses in a dejected manner for the return trip down the M4. [right] Osprey Jonathan Thomas dominant in the lineout, just as the rest of his team were dominant elsewhere on the pitch. The Ospreys are due at Vicarage Road in a fortnight for the Heineken Cup Quarterfinal against Saracens. Let's hope they don't get such an easy ride next time! Two casualties of the game were Osprey Mike Phillips who sustained a cruciate knee ligament injury and will be out for up to six months. 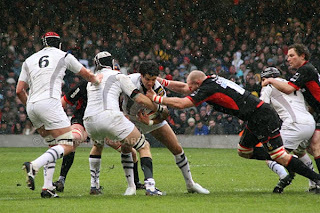 And Sarries' Kiwi Lock Chris Jack who's hand injury rules him out for the rest of the season. He will certainly be missed, on and off the pitch. The Ospreys are now set for their EDF Final against the Tigers. And Sarries fans are praying The Gaffer can undo the damage to morale for the team. See more match photos from the game.